Aftermarket performance enhancing accessories have already begun arriving for the TVS Apache RR 310, a flagship sportsbike from Indian motorcycle maker TVS. 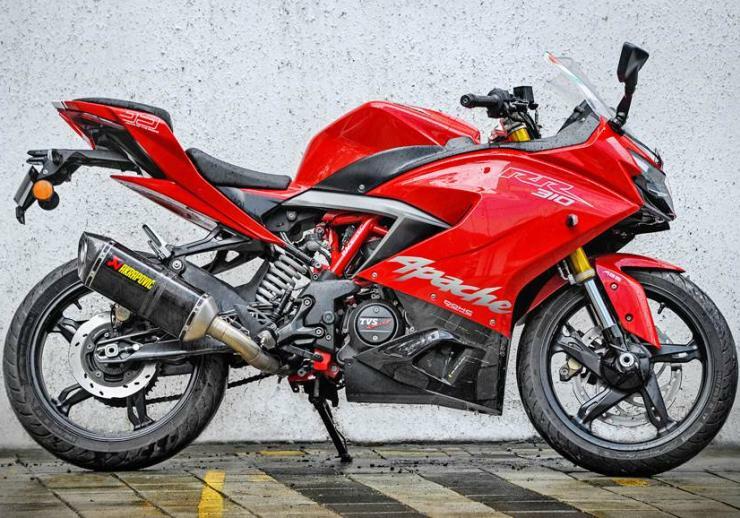 Slovenian exhaust specialist Akrapovic has come up with a full exhaust system for the TVS Apache RR310, which is said to boost peak power by 2.4 Bhp and peak torque by 2.7 Nm. The Akrapovic full exhaust consists of an end can and the header. The exhaust is also much lighter than the stock unit, and this affords a weight reduction of nearly 4.6 kilograms. This exhaust is also compatible with the BMW G 310R and GS 310R, two new motorcycles that will be launched in India later this week. The exhaust is very expensive though, at Rs. 55,000, and is sold by Performance Racing Store in Mumbai. There’s no ECU remap needed with the new aftermarket exhaust as the stock ECU of the TVS Apache RR 310 is capable of compensating fueling on its own. Now that Akrapovic has come up with an exhaust system for the Apache RR 310, it’s only a matter of time before local aftermarket exhaust brands in India also start building free flow exhausts for the motorcycle. The aftermarket exhausts built by Indian aftermarket performance brands are likely to be priced much lower than that of the Akrapovic unit. The Apache RR 310 is one of the best selling fully faired sportsbikes in India, what with TVS Motors managing to ship out nearly 800-1,000 monthly units of the motorcycle on an average. Priced at Rs. 2.23 lakhs in most parts of India, the Apache RR 310 shares its engine, suspension and platform with BMW Motorrad’s small capacity motorcycles, such as the G 310R and GS 310R. The Apache 310 is powered by a 311-cc, four-stroke reverse inclined single cylinder engine with 34 Bhp-28 Nm on tap. A 6-speed manual gearbox is standard. The fully faired motorcycle has been designed for use on the road and track.